According to this article airlines lost 42 million items of passengers luggage in just one year. The figures from Which? Holiday indicate that a growing number of bags are being delayed lost or damaged. Most incidents occur when bags are being transferred from one aircraft to another according to SITA a company that specialises in IT solution for the aviation industry. Problems also arise when the the airport code is misread on the luggage tags. The report also found that budget airlines Ryanair and Jet2 paid out the lowest amount of compensation to people affected with Ryanair often limiting payouts to £15 and Jet2 refusing to reimburse people for claims under £30. With passenger numbers expected to reach 2.75 billion by 2011 experts predict the number of mishandled bags could soon reach the 50 million a year mark. 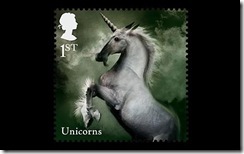 A set of new stamps have been launched by Royal Mail that feature mythical creatures. The stamps include a fire breathing dragon, a giant carrying a bolder, a grey unicorn, a mermaid and a pixie riding a snail. They have been designed by artist Dave McKean and novelist Neil Gaiman. 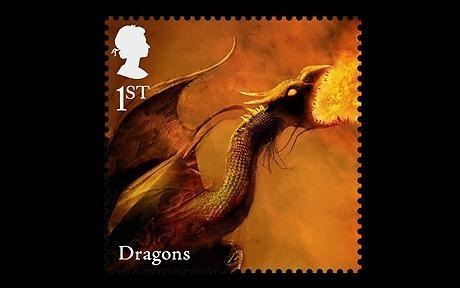 The aim of the new stamps was to bring together some of the well known characters from ancient folklore and legend. Pictured are two of the designs for the 1st class stamps. Royal Mail has launched a tamper proof stamp which should stop people pealing off old stamps and reusing them. 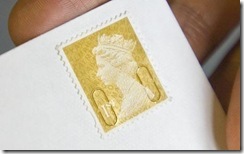 The problem whilst it might seem minor costs Royal Mail tens of thousands of pounds every year. Although stamps are franked when they go through the sorting office, the markings on them are not always noticeable and often stamps with little markings on them are peeled off and used again. The new stamps, however, should make it impossible to reuse them. They have two oblong strips on either side of the stamp so that when the stamp is peeled off the strips are left behind. This leaves a useless stamp with two holes in it which should now be unusable. Ryanair has recently revealed that it made a £145.9m loss in the year to March. The loss was partly caused by a 59% rise in its fuel bill. The loss compares with a profit of £336.8m in the previous year. Despite the loss the Ryanair boss Michael O'Leary has said that he hopes to see a recovery in the current year as fuel costs are expected to be lower. Following the news Ryanair shares fell by 6%. Thousands of tube workers are due to strike in two separate disputes over pay and proposed job losses. The vote by members of the Rail, Maritime and Transport union (RMT) will mean that workers will begin a 48 hour strike on the 9th of June starting at 1859. The strike is likely to bring most of the tube network to a standstill. RMT members voted overwhelmingly in favour of strike action with 2,810 and 488 against. The strike comes as a five year pay deal offered by London Underground has been rejected as unacceptable. The RMT is also opposed to TFL's planned efficiency savings package which the union has said will lead to redundancies.